Organised by the Ministry of Education, Youth and Sport (MoEYS) with the support of the International Labour Organisation (ILO), and the United Nations Volunteers (UNV) programme, the event aimed to help Cambodia’s youth understand more about entrepreneurship and raise awareness of the concept of entrepreneurship as a path of opportunity. Holding events simultaneously across the country was a risky move, but it proved to be a huge success, with students enjoying taking part in a programme based on a trainer-less, activity-based learning model, and picking up crucial entrepreneurship skills and networking with other young people. Through the workshops she made new friends from different schools, with everyone “learning from each other and sharing ideas,” she added. Student Vann Manuth (Center left) interacting with other students at CED in Phnom Penh. Ky Leab, the Principal of Wat Phnom High School in Phnom Penh said that he is glad that his students got to take part in the programme, and felt that it was an important opportunity to learn essential entrepreneurial skills, exchange ideas, and network with other like-minded youth who attended the weekend event. “All the students came here on their own, all we did was inform them,” he noted. 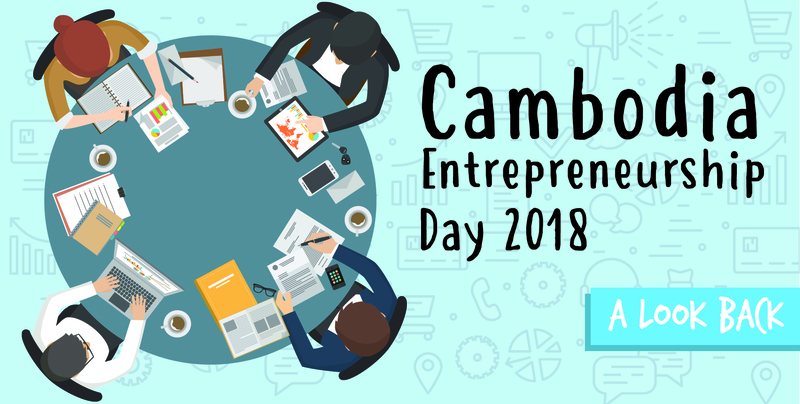 The Cambodia Entrepreneurship Day builds on a Guinness World Record event held in August 2017, when MoEYS, the ILO and UNV carried out the world’s largest practical business seminar – 2304 participants learning simultaneously, supported by over 300 youth facilitators. “We now have a year to plan, to mobilise support, and to build on what we learned. One idea might be to get all the upper secondary, university and technical schools involved, so that we really boost participation. If we doubled participation from 2017 to 2018, how much bigger can we make this in 2019? Let’s see – we now should start looking at that,” explained ILO Enterprise Development Specialist Charlessaid Mr Bodwell., an Enterprise Development Specialist at the ILO. After CED’s inaugural success, the organisers plan to make it an annual event and Geeks will definitely be there to cover it again.